Nate McCoy has a problem - he can see and interact with past versions of himself. The people he reincarnated from. As a P.I., the help of Jameson, a Wild West lawman, and Alan, a 1960s-era hitman, is invaluable to bringing down the city's kingpin. But it makes his personal life a mess, as Nate can't be sure if this 'power' of his makes him crazy or insane. From acclaimed comics writer Michael Moreci (Roche Limit, Suicide Squad) and artist Keith Burns (Ex-Con, Johnny Red) comes a crime noir story with humor, heart, and head wounds. 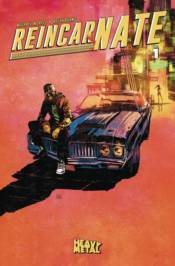 Fans of Chew and Criminal will find plenty to love in ReincarNATE.